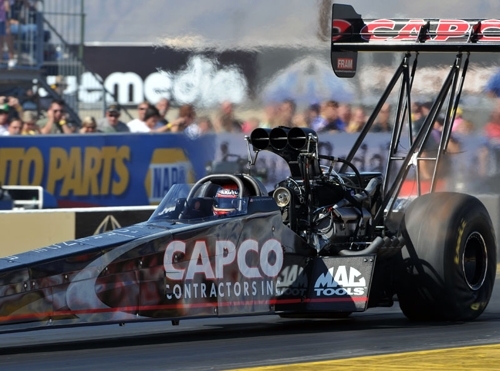 While the top 10 Top Fuel drivers are fighting for more NHRA Countdown to the Championship points in this weekend’s Big O Tires Nationals, Steve Torrence and his Torrence Racing/Capco Contractors Inc. team will be focusing on running quicker at The Strip at Las Vegas Motor Speedway. Torrence, who finished eighth overall last year in his first season of Full Throttle Drag Racing Series action, is looking ahead to 2012 as the 2011 season dwindles to its final two races. This is the third event for the new team. Cooler temperatures – the early forecast predicts 80 degrees – will enable crew chief Richard Hogan to continue experimenting with various combinations. According to Hogan, it is likely Torrence could improve his best 1,000-foot time of 3.976 seconds (at Phoenix, Oct. 16) in his new ride. “The better conditions mean we will have to run quite a bit quicker at Vegas just to qualify,” Hogan commented. “I think the times will be in the 3.8 (second) range this weekend. We were fortunate to be able to get the basic things sorted out on our new car and the fuel system.